In 1939 he began attending Weber High School, where he was active in track and field, played the trombone in the school band, and joined the Photography Club. During this time one of his favorite school activities was taking photos for the yearbook. He finally bought his first camera—a 35 mm Argus C-3 with an f3.5 lens and a flash. He rolled his own film in a closet at home and soon he set up a darkroom. He continued to add new equipment, including a little printer that made 4 x 5 inch prints and a photo enlarger, a Christmas present to himself purchased on 21 December 1940—for $39.50. Traveling from Chicago on 7 December 1941 J heard the news of the Japanese attack on Pearl Harbor over the radio. He recorded in his journal, “It was startling news, but I didn’t really know what it meant for me.” Within a year it would change his life dramatically. He decided to study photography at Los Angeles City College and registered in September 1942. 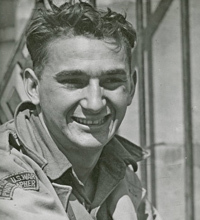 In October 1942 he enlisted in the Army Reserve Corps and by early November he was studying at Paramount Studios as a part of the Signal Corps Photographers School. 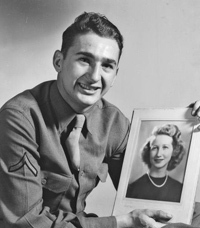 By April 1943 he was called to active duty and on 3 September 1943 the 167 Signal Photographic Company was activated at Camp Crowder, Missouri. By December he was at Cumberland University in Lebanon, Tennessee, where he was finally issued two cameras—a 4 x 5 Speed Graphic for official photographs, and a Leica 35 mm camera. 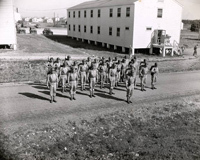 During basic training in Lebanon, Tennessee, Heslop took his first official army photos while documenting war games. The trainees set up a photo lab in the basement of one of the buildings at the University, where they processed their pictures. J received the rank of Technician 5th Grade, T/5, the equivalent of a Corporal while in Tennessee. J married Fae Stokes on 1 May 1944 in the Salt Lake Temple of The Church of Jesus Christ of Latter-day Saints (LDS), and shortly after, on 23 July 1944, shipped out for Europe on the troopship NY–23, the Mauritania. 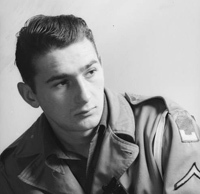 By the early age of 21 J was a married man and heading to Europe to photograph and experience the war. His photographs provide a moving and memorable visual witness to the final nine months of the war’s European Theater, from September 1944 to the end of the war in May 1945. 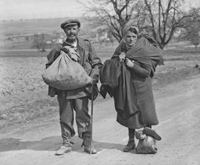 Much was packed into those nine months as he served in Austria, Belgium, France, Luxembourg, and Germany. 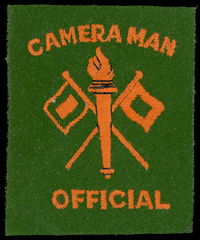 He photographed the U.S. Army Counter Intelligence Corps (CIC) activities. He documented Charles DeGaulle and Winston Churchill in Paris and portions of the last German offensive known to Americans as the Battle of the Bulge. Other events he photographed include the psychological warfare tactics of the 2nd Mobile Radio Broadcasting Company in Luxembourg; the ruins of Eschweiler, Durwiss, Aachen, and Naumberg; the 9th Armored Division west of the Rhine River; the suicide of the mayor of Leipzig with his wife and daughter and the chief of police; the birthplace of Hitler (Braunau, Austria); POW camps; the surrender of German soldiers; and refugees and displaced persons in horse-drawn carts and on foot carrying what little they owned. Perhaps nothing was more revealing of war’s devastation than the 8 May 1945 liberation of the concentration camp at Ebensee, Austria. Ironically, this experience coincided with the announcement of the unconditional surrender of the Nazis. Heslop covered local, national, and international events while at the Deseret News, from the inauguration of Utah’s governors to those of Presidents of the United States. He was on President Harry Truman’s campaign train in Colorado and rode with the party to Salt Lake City. He covered airline crashes and mine disasters, and for many years traveled extensively on LDS Church related assignments. His five trips to Israel and the Middle East and his coverage of Cambodian refugees in 1979 produced numerous articles and hundreds of moving and exquisite photographs. During his busy professional years, J and Fae also raised a family of five children—Paul, daughter Lyn, Scott, Ann, and Don and became the grandparents of nineteen. A loving family man, J and Fae’s autobiography, Doubletree Adventure: Autobiography of J Malan and Eleanor Fae Stokes Heslop is filled with pictures of the growing family and their exploits and interests. It is also filled with their active involvement as members of the LDS Church, including their service as mission president in the Chicago North Mission.7 Upon retirement in 1988 J and Fae continued to travel, spend time with family, and be involved in their church. Importantly, J is still taking photographs wherever he goes. The L. Tom Perry Special Collections Department of the Harold B. Lee Library, Brigham Young University, is the grateful recipient of a large portion of his collection. Still in the process of organizing and describing this collection, it is estimated that there are over 55,000 individual photographs. J Malan Heslop and Eleanor Fae Stokes Heslop, Doubletree Adventure: Autobiography of J Malan and Eleanor Fae Stokes Heslop (Salt Lake City: Lincoln Press, 2004), 1:J-2. Dell R. Van Orden, “J M. Heslop Editor’s Retirement Marks End of an Era at the Deseret News, 29 June 1988, C-1.